– Detoxing: ingredients that purify the skin and help reduce accumulated damage tdue to sun exposure, pollution, air-conditionning. Active ingredients are chosen to provide vitality and protection to skin cells DNA. – Repairing: ingredients that minimize signs of ageing, such as pigmentation and fine lines. – Destressing: ingredients that help fight oxidative stress, one of the biggest factors to have negative impact on our skin as we age. Their aim is to balance the skin and make it look healthy. – Recharging: ingredients that give cells the energy and help enhance Collagen and Elastin production. – Night Treatment Nutrition aromatherapeutic cream with 21 actives to repair skin & relax senses, it is one of Dafna’s personal favourites (and after using it for a month, so is mine, but running pretty close to the serum as well!). This cream addresses various skin needs, including lightening the skin prone to pigmentation, but even more importantly, it helps bring the skin into equilibrium. Dafna developed it with mature, dry and normal skin in mind and calls it ‘food for the face’. This aromatherapeutic cream puts you at ease as soon, as you inhale its calming aroma and I adore putting it on my skin as soon as I come home in the afternoon or evening, letting it work its magic on my skin & my mood ahead of bedtime. In its base it has essential oils & plant extracts, but its foundations lie in the advanced Biotechnology extraction and maximisation of ingredient efficacy. The list of components, like green tea, reishi, propolis make me good hungry and the scent of vanilla and rosewood calms the fraught mind, as intended, very quickly. It also has a rich texture, which sinks effortlessly and quickly into the skin & I like ‘tapping’ it into my skin, releasing the tension, increasing the circulation & drainage, as well as making sure my skincare works more effectively. Another lively surprise is the ‘lifting’ effect that it almost instantly has on your skin – don’t confuse it with tightness – so I recommend extending its application to your neck & decollate area! A couple of times a week I combine the serum, that I review below, with Nutrition, and they create a very powerful synergy together, to such an extent that not only do I notice how my skin looks, but I actually get compliments from strangers. It really is a luxurious beauty and wellbeing cocoon encapsulated in a sophisticated crystal violet jar, that turns my evening skincare ritual into a pampering session at the spa, but in the sanctity of my own bathroom. – Day treatment Moisture cream has 19 actives to revitalize skin & uplift the senses. It is supposed to be used both morning and night and was created based on tester’s feedback. Notably, it contains hyaluronic acid in small molecules and penetrates the skin well. The scent of neroli and lavender is uplifting, yet relaxing. Again, judging this one ‘superficially’, only having tried several samples of it. – Day Treatment Moisture Light cream with 19 actives has the same effect as the cream above, but works particularly well for mixed skin, as well as sensitive. Dafna recommends using this cream in warmer weather. – Anti-Ageing and Glow serum contains 11 actives and is the product I will tell you more about further down. – And one of brand’s best-sellers, – Eye Care to repair and revitalise the delicate skin around the eyes with 16 potent actives. It has light texture and customers really seem to love it, possibly because it is suitable for all skin types. The cream contains chicory root, which improves the circulation that can be stagnant is that area, plus helps reduce fine lines. It is easily absorbed and works perfectly well as a base for make-up, notably concealer. Now, to the Anti-Ageing Serum & Glow, the role of which, in general, shouldn’t be underestimated in our daily skincare routine. The formula of this serum is composed from natural active ingredients obtained via advanced Biotechnology of extraction, called TensUp. It has a double effect: immediate lifting (it is a kind of matrix that stretches over the face and creates the lifting effect) and long-term anti-ageing (collagen production and synthesis) with regular use. Dafna says that this serum offers one of the most advanced solutions to combat skin’s anti-ageing process, something we all want to delay for as long as we can. You have such actives as Rosehip and Olive oils that nourish and soften; Chicory Root Oligosaccharides that increase collagen synthesis and production, resulting in almost immediate ‘tightening’ effect, as it ‘closes the pores and plumps the skin, due to Hyaluronic Acid which helps to maintain skin’s hydration levels. After using this serum for about two weeks I noticed improvement in radiance and general feeling of my skin’s contentment. 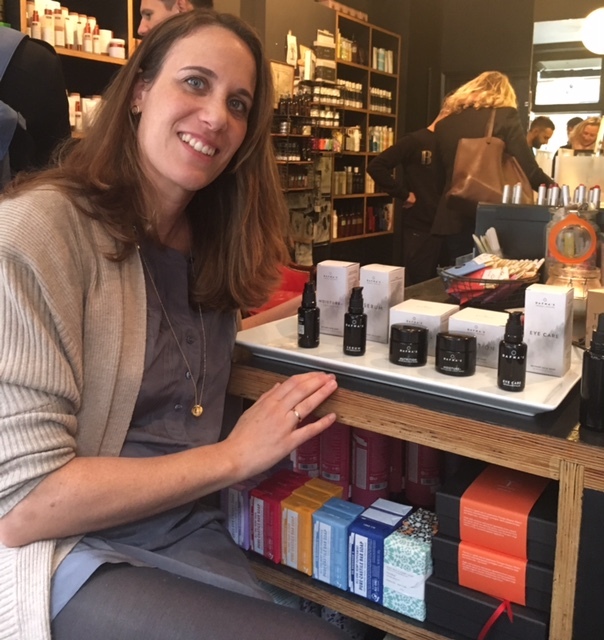 Dafna recommends using this serum before the party or even better, for a few days before the party or an importantly event, consistently, and then you do notice a difference in your skin – how it looks (more glowy in my case), feels and helps make-up stay ‘fresher’ looking for longer. I was really taken with this serum’s light, yet sophisticated texture that feels like a creamy gel and which sinks into your skin without a trace, just making your complexion look and feel plumper and better moisturised. Its subtle scent is comforting and applying it to the skin feels like a mini-ritual in itself. I ended up using it on its own in the mornings, maybe with half the usual amount of my moisturiser and ‘topped’ up with the night moisturiser at night and it seems to have offered my skin exactly what it needs, as the weather started cooling down and then warmed up again, proving the versatility of its formula. This serum works well for all skin types but if you have oily skin, use it as a stand alone product, with no cream/moisturiser afterwards. If you have other skin types – apply, leave for a couple of minutes and then apply your usual cream, lotion or moisturiser. You can use it day and night but if you prefer, you can use it just at night-time. To find out more about Dafna’s Personal Skincare click here. In the UK the products are available in-store & online at Content. Dafna’s products don’t contain the following: parabens, mineral oils, allergens, dyes, synthetic preservatives or synthetic fragrances. All ingredients are certified by Natrue and Ecocert and organic essential oils are Soil Association certified. The brand is against animal testing. The products come in Crystal Violet packaging that protects formulas from light exposure and are made in Spain.